This deck of cards became known as the "map deck." 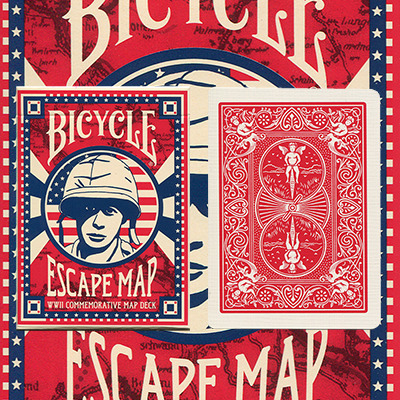 It was made by hiding maps of top-secret escape routes between the two paper layers that make up all modern playing cards. There is one on display at the Spy Museum in Washington, D.C., and another one said to be in private hands. It's possible that these are the ONLY two surviving examples. The card shown in the picture here is a limited edition reproduction made in April of 1990. The history behind this deck is very interesting - it was originally a very real deck that actually functioned during the war, although obviously it didn't look exactly like this one, since the map was hidden between card layers. But the cool thing about this deck is how all the cards can be placed together like a puzzle to make an actual map. I thought it would make the individual cards ugly, but they actually look quite impressive in real life, due to the level of map detail on each. 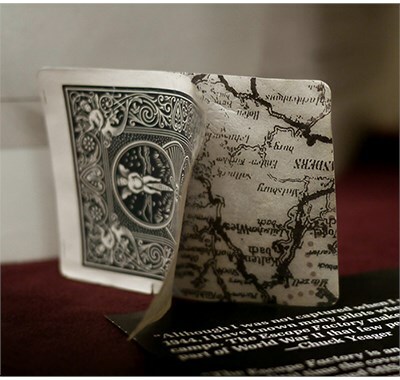 The deck comes with extra cards explaining the history and also with a "key" to how to lay out the cards to make the large map. Very cool!